The Athabasca River basin has produced one significant writer, George Ryga. As a playwright, novelist and poet he has left an important legacy in Canadian literature. His play, The Ecstasy of Rita Joe, is considered to be one of the most important dramas produced in English Canada and is typical of his controversial political views. George Ryga was born in 1932 in Deep Creek, near Athabasca, Alberta, into a family of Ukrainian immigrants who had arrived in Canada in 1927. In this remote rural community George grew up speaking Ukrainian and began to learn English when he attended school in a one-room log school house. At age 13 his formal schooling stopped and Ryga had to work at odd jobs to help his family’s subsistence farming. He took correspondence courses and won a creative writing competition that gave him a scholarship to the Banff Centre for the Arts. Ryga then worked at various jobs in Edmonton including writing for radio. In 1955 Ryga went to Scotland to study the work of poet, Robert Burns. He continued to write prose and poetry back in Alberta and worked at several jobs. 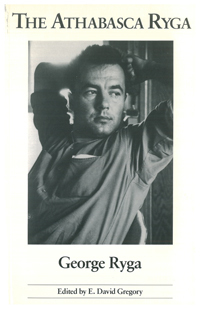 Between 1961 and '62 he worked on his first play, Indian, which came from his experiences working alongside Cree Indians on the farms of Deep Creek. This play was produced in CBC television and launched his writing career. He quickly produced six TV plays, short stories for radio and a number of stage plays. The Ecstasy of Rita Joe premiered at the Vancouver Playhouse in 1967 and was the first English language play put on at the National Arts Centre in Ottawa in 1969. His next play, Grass and Wild Strawberries (1969) was a great success and included original music from the group Chilliwack. Commissioned by the Vancouver Playhouse Ryga wrote the political play, Captives of a Faceless Drummer (1971), which parallels the events of the October Crisis of 1970. The board of directors decided not to produce the play because it was too controversial, the artistic director David Gardner was dismissed and Ryga was given the reputation as too radical.